A new Stigler Center working paper shows that after decades of decline, profits started increasing in the early 1980s. Financial profit is ostensibly the goal of almost all business activity. It is the incentive to create new ideas, firms, and products. At the same time, sustained periods of profits are an indicator of a lack of competition. Firms earn profits by charging consumers high prices and by paying wages that fall below labor productivity. To the extent that the owners of firm profits are rich (entrepreneurs and equity owners), increasing profits contribute to increasing income inequality. Over the past few years, we have seen a renewed interest in profits. The New York Times, The Economist, The New Republic, and many other media outlets have written recently on the negative consequences of high profits. Nobel prizewinners Angus Deaton and Joseph Stiglitz have advocated for greater antitrust enforcement as a way of reducing both rent-seeking and inequality. Citing recent academic research, Senator Cory Booker (D-NJ) has raised concerns to the Department of Justice and the Federal Trade Commission over rising corporate concentration and its impact on labor markets and wages. Are today’s profits high by historical standards? Are corporate profits related to the ability of corporations to influence regulation and policy or are these profits the result and reward of firm innovation? Can government influence competition through the relaxing and tightening of antitrust enforcement and merger guidelines? 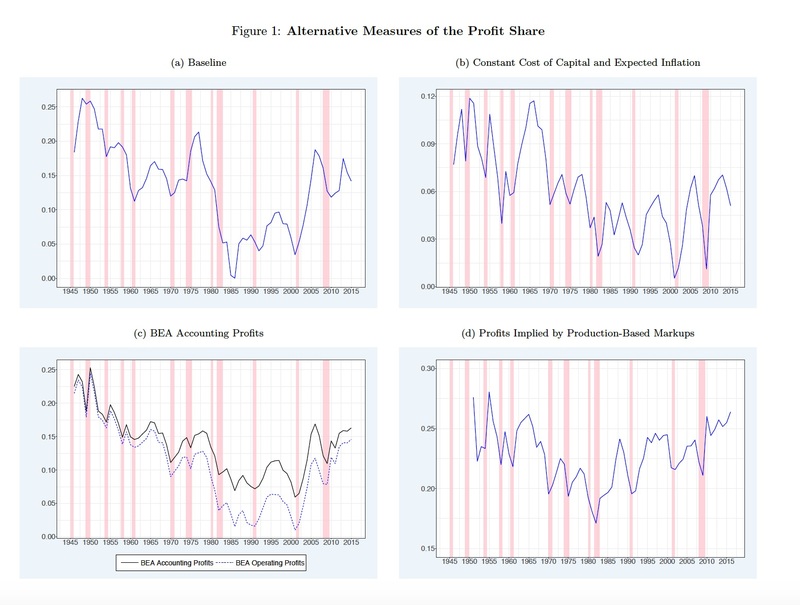 Despite the central importance of profits for both economic research and public policy, we have little historical data on the evolution of corporate profits. In our recent paper “70 Years of US Corporate Profits,” we provide a measurement of US corporate profits from the end of WWII to the present day. Our paper documents three important findings. First, profits had been declining in the decades following the Second World War. Second, profits have been increasing since the early 1980s. Last, the early 1980s are a point of sudden change. As a share of total income, profits today are higher than they were in 1984, but lower than their value in the late 1940s. Measurement alone cannot tell us what is responsible for these trends in profits or the sudden change in the early 1980s. Just like income inequality, measurement alone cannot tell us whether the natural state of the economy is one of high profits (as seen today and in the 1940s) or of low profits (seen in the early 1980s). At the same time, we hope that our results will encourage and serve as the basis of future research. Measuring profits presents a significant empirical challenge. A simple example can help illustrate this point. Consider a small business with $1 million in sales, $500k of intermediate inputs purchases, $350k in paid wages, and $100k leasing costs for equipment and real estate. We refer to the leasing expenses as capital costs. After accounting for all production expenses, the firm is left with $50k in profits. Now imagine an identical firm that, instead of leasing, owns its equipment and real estate. We would no longer observe the annual leasing expenses of $100k. Instead, we would see that this firm has $150 in operating income that reflects the opportunity cost of its equipment and real estate ($100k) as well as the firm’s profits ($50k). Whenever a firm owns part or all of its capital (equipment and real estate), we need to attribute part of the firm’s operating income to the opportunity cost of this capital. We approximate the leasing expenses of the capital owned by firms and subtract these leasing costs from the firm’s operating income to reach a measure of firm profits. We apply this methodology of approximating leasing costs to the US corporate sector in order to construct our aggregate measure of profits. There are two separate reasons to be concerned with our approach to measuring capital costs and profits. First, there are ex ante concerns. Even before seeing the results of the measurement, we have to acknowledge limitations of the data. The BEA construction of a capital stock requires inputs that may be imprecisely measured (investment rates, depreciation rates, and price deflators) and the method of aggregating these inputs into a stock of capital requires further assumptions (perpetual inventory method). Similarly, our approximation of the cost of leasing a dollar of capital requires imprecisely measured inputs (nominal rates, depreciation rates, and price deflators). In addition to these ex ante measurement concerns, our measurement of capital costs and profits reveal ex post concerns. After seeing the results of the measurement, several notable features of the data point to a potentially large role for measurement error. Our measures of capital costs and profits (measured as a share of total income) (i) are far more volatile than labor costs, (ii) are highly negatively correlated with each other but not so much with labor costs, and (iii) move a lot over the late 1970s and early 1980s (a period with volatile inflation). Are these features of the data economically meaningful or are they symptoms of noisy and unreliable estimates? We combine two approaches to addressing the concern of measurement error. First, we take steps to validate the quality of the inputs into our calculation and show that the results are not sensitive to alternative approximations of the cost of leasing a dollar of capital. Our finding of a decline in the profit share of income from 1946 to the early 1980s and a subsequent increase is not sensitive to alternative inputs or alternative approximations of the cost of leasing a dollar of capital. At the same time, we find that the level of estimated profits during the late 1970s (a period of high and volatile inflation) is sensitive to alternative approximations of leasing costs. Second, and more importantly, we consider alternative measures of profits that are not likely to be subject to similar concerns of measurement error. First and closest in methodology to our baseline measures, we recalculate capital costs and profits under the assumption that the cost of leasing a dollar of capital is constant over time (fixed real rate).1)This approach is taken by Rognlie (2015). Next, we consider two BEA measures of accounting profits. The first of the BEA measures of accounting profits (accounting profits) includes the profits generated from business operations as well as interest received, which is a form of financial income. The second BEA measure (operating profits) is accounting profits less interest received and therefore only includes profits that are generated from business operations. Last, we consider the profits that are implied by the production-based estimates of markups of Traina (2018) (production-based markups). Each of these comparison measures has drawbacks. The fixed real rate approach ignores all of the important variation in the cost of capital over time. To the extent that real rates have been trending over time, this measure will vastly understate the trends in profits. The BEA measures of accounting profits don’t necessarily measure economic profits. Our baseline estimates rely on the BEA construction of a capital stock and on the approximation of the cost of leasing a dollar of capital to distinguish between economic profits and accounting profits. If measurement error were responsible for our findings, we would expect the measures of accounting profits to show no trends. The estimation of markups in Traina (2018) requires many parametric assumptions, and further assumptions are needed to convert these markups into implied profits. At the same time, the time series variation in markup-implied profits do not rely in any way on measures of capital or approximated leasing costs. Three features of the data are remarkable robust across the different measures of profits. Measured as a share of total income, all of the measures of profits show that (1) profits had been declining from the end of WWII until the early 1980s, (2) profits have been increasing since the early 1980s, and (3) the early 1980s are a point of sudden change. While each of the alternative measures of the profit share has shortcomings, the common features that we find across the various measures give us confidence that the time series variation of the profit share of income that we are documenting is economically meaningful. Despite the similarities, there are substantial differences between the measures of the profit share. The measures differ in the magnitude of the increase in the profit share since the 1980s. One period with a particularly severe divergence across the measures is the late 1970s. Our baseline measure is the only one to show a high level of profits during this period. As the 1970s were a period of particularly high and uncertain inflation, it is possible that during these years measurement issues lead us to find exaggerated profits. In recent research, Loukas Karabarbounis and Brent Neiman have suggested that the measured increase in profits over the past 30 years is the result of mismeasurement in the approximation of the cost of leasing a dollar of capital. Specifically, they point to the high measured correlation between the real interest rate and the profit share of income. The common features that we find across the various measures of profits help us rule out any form of mechanical relationship between profits and real interest rates. In all of the alternative measures, we do not use variation in the real interest rates to approximate leasing costs of capital. At the extreme, the production-based estimates of markups do not rely on any variation in interest rates or capital. If mismeasured capital or leasing costs were responsible for our findings, or if our measure of profits were mechanically linked to interest rates, we would expect these alternative measures of profits to show no trends. While our evidence strongly suggests that there is no mechanical relationship between interest rates and profits, two recent papers argue for an economic relationship in which an increase in market power causes an equilibrium decline in the real rate. While each of the alternative measures of the profit share has shortcomings, the common features that we find across the various measures give us confidence that the time series variation of the profit share of income that we are documenting is economically meaningful. What Might Explain the Trends in Profits? Some have theorized that variation in the profit share of income is driven by adjustment costs. If it takes time for businesses to build up their production capacity, other firms can make profits while their competitors catch up. The central prediction of this theory is that high profits are accompanied by high investment. Contrary to the predictions of this theory, the data show that declining profits (1946–84) were in fact accompanied by increasing investment and the later increasing profits (1984–2016) were accompanied by declining investment. Another theory is that the recent increase in profits is actually a return to unmeasured intangible investments. While there is likely some truth in the idea that recent investments by large successful digital platforms in accumulating and analyzing data may be particularly likely to be missed by the BEA, there are two challenges to this hypothesis. First, the scale of the mismeasurement would have to be extraordinarily large to explain all of the increase in profits.2)See Barkai (2016). Second, this theory is silent on the high profits of the post-WWII decades and the sudden change in the early 1980s. Secular changes in competition are a natural explanation to consider for the fall and rise in profits. 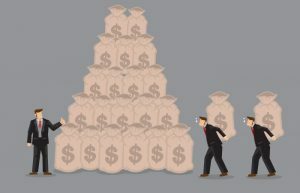 A recent literature provides evidence that a decline in competition has contributed over the past 30 years to lower wages for employees, lower investment, and higher market valuations. Two notable policy changes point to the early 1980s as a possible break in the trends in competition. First, there was an increase in antitrust enforcement from the mid-1940s to the early 1980s, followed by a decline from the early 1980s to the present.3)See Posner (1970) and Gallo et al. (2000). Second, the Department of Justice adopted a more lenient merger guideline in 1982. As Peltzman (2014) shows, industry concentration began rising after this change to the merger guideline. While a change in competition is a promising explanation, not all of the recent research points in this direction. In their recent paper “The Fall of the Labor Share and the Rise of Superstar Firms,” Autor et al. argue that increases in profits are due to an increase in competition as a part of globalization. As firms from across the world come into closer contact, those that are the most productive (and profitable) are able to grab a larger share of demand. In future research, we hope to better distinguish between these competing explanations. Simcha Barkai is an assistant professor of finance at the London Business School and junior fellow at the Stigler Center for the Study of the Economy and the State. Seth G. Benzell is a postdoctoral associate at the MIT Initiative on the Digital Economy. The Rise of Market Power and the Decline of Labor’s Share New Study Shows Just How Bad the US Labor Market’s Competition Problem Really Is Could the Steward Health v. BCBS Trial Revitalize Monopolization Law? 1. ↑ This approach is taken by Rognlie (2015). 2. ↑ See Barkai (2016). 3. ↑ See Posner (1970) and Gallo et al. (2000).